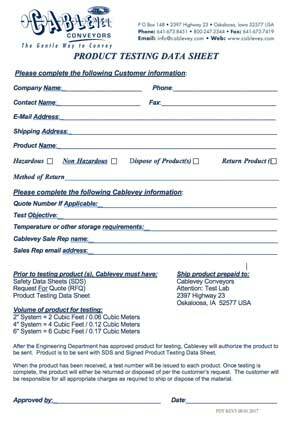 After the Engineering Department has approved product for testing, Cablevey will authorize the product to be sent. Product is to be sent with SDS and Signed Product Testing Data Sheet. When the product has been received, a test number will be issued to each product. Once testing is complete, the product will either be returned or disposed of per the customer’s request. The customer will be responsible for all appropriate charges as required to ship or dispose of the material.